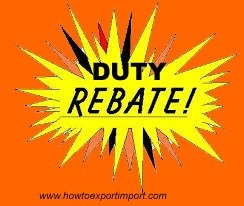 Export Under Claim of Rebate of Duty under Central Excise. 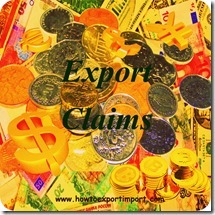 The exporter is required to submit application in ARE-1. In sixtuplicate (six copies) to the Superintendent or Inspector of Central Excise having jurisdiction over the factory or warehouse of the exporter at least twenty four hours before the removal for inspection. However, where exporter is unable to give 24 hours advance notice to the superintendent of Central Excise, his request for inspection with a shorter notice also is, normally, accepted. It will be sufficient if the copies of ARE-1 contain a color bank on the top or right had corner in accordance with above color scheme. ARE-1 is introduced in place or earlier AR-4 and AR- 5 forms. The Superintendent of Central Excise may depute an Inspector of Central Excise or he may go for examination of the export consignment and sealing. Where the ARE-1 indicates that the export is in discharge of an export obligation under a Quantity-based Advance Licence issued under the Duty Exemption Scheme, the consignment should invariably be examined and sealed by the Superintendent of Central Excise himself. The Central Excise Officer, after examining the consignment, would draw samples wherever necessary, in triplicate. He would hand over two sets of samples, duly sealed, to the exporter or his authorized agent, for delivering to the Customs Officers, at the point of export. He would retain the third set for his records. The packages in which the goods are to be exported would be legibly marked as “export cargo” in ink or oil color or in such other durable manner with progressive number commencing with No.1 for each calendar year and with the exporter’s name. these marks and numbers are to be specified on all the six copies of ARE-1 forms. Excise authorities maintain Personal Ledger Account manufacturer-wise. Amount paid by the exporter towards excise duty would be credited to the exporter’s account. As and when the excise authorities clear goods, applicable excise duty is debited to the Personal Ledger Account and balance is arrived at. The procedure is similar to a current account maintained with a bank. Exporter has the option to name Maritime Commissioner or jurisdictional Assistant Collector of Central Excise for claimed rebate of excise. Where the export is from any of the port, airport or post office falling within the jurisdiction of Maritime Collector of Central Excise, option is available to file claim of rebate before such Maritime Collector of Central Excise or the Jurisdictional Assistant Collector of Central Excise. For this purpose, exporters are required clearly indicate their option on ARE-1 along with complete postal address of the authority from which the rebate shall be claimed. Exporter should be advised to take adequate care in filling up the ARE-1 form. The rebate sanctioning authority along with its complete postal address should be clearly mentioned at appropriate place in the ARE-1. The applicable portions should be carefully retained and inapplicable portion struck off. The original, duplicate and sixth copies of ARE -1 form are handed over to the exporter. The triplicate copy is sent to the Maritime Central Excise Collectorate Refund section, having jurisdiction over the port, wherefrom the goods are to be shipped. This copy on the request of exporter may be sealed and handed over to the exporter/ his authorized agent for presenting to the rebate sanctioning authority. The fourth copy is sent to the Chief Accounts Officer(CAO) of the Maritime Central Excise Collectorate concerned. The Range Superintendent, for his record and future reference, retains the fifth copy. Original and Sixtuplicate : To be handed over to the Exporter. Original shall be used for filling rebate claim. Duplicate: Customs sends this copy to Rebate Sanctioning Authority, declared on ARE-1. This copy on a request of exporter may be sealed and handed over to the exporter/his authorized agent for presenting to the rebate sanctioning authority. Sixtuplicate copy: Used for claiming incentives (duty drawback). Depending upon the exporter’s option declared on the ARE-1, the claim should be filed with the jurisdiction of Maritime Collector of Central Excise or with Assistant Collector of Central Excise having jurisdiction on the factory of the exporter for claiming the rebate of excise duty on goods exported. (e) Original copy of duly ARE-1 duly endorsed by the Customs Officer. (f) Disclaimer certificate in case where the claimant is other than the exporter. The claim has to be filled within six months form the date of excise clearance from the factory for the purpose of shipment i.e. time prescribed under section 11B of Central Excise and Salt Act. The maritime Collector or Assistant Collector, Central Excise would verify and compare the original copy of ARE-1 received from Customs Officer and triplicate copy of ARE-1 received from Range Superintendent Central Excise. If the claim is in order, he will order for sanction or rebate, either in part or in full. The rebate claim can also be claimed by electronic declaration on Electronic Data Inter-change (EDI) System. The rebate sanctioning authority should point out deficiency, if any,, in the claim within 15 days of lodging the same and ask the exporter to rectify. The excise department should make the refund within a period of 3 months from the date of receipt of claim. In case of delay, interest @ 20% will be paid from the date of expiry of three months to the actual date of payment. This interest provision is really beneficial to expedite refund, as interest would be a burden to the department, in particular the above interest rate is higher than the prevailing bank interest rate. Have you satisfied with this article about claim of rebate under Central Excise? Share your thoughts on this article about central excise export clearance procedures and formalities under claim of rebate. Santhosh: On 17 October 2013 Really This website has tought me in every thing regarding Customs EXPORT clearance and More. I should Appreciate for giving inform to every one. Please keep going. Bharat Brahmbhatt: On 16 January 2014 My question is the excise department how many days the Rebate amount cheque give to the exporter. Example : ABC Ltd. submitted Rebate Claim rs.1 lakh in Central excise deptt. while department when should cheque issued ? Viral Gupta : On 07 February 2014 Very Useful........ Nicely Define... Good... Keep It up !!!!!!!!!!!!!!! UMESH YADAV: On 01 March 2014 Here i'm beginers for Export/ import & Get more information about export duty payment procedure & filing ARE-1 etc.literlly interesting Article. DILIP R LADVA: On 18 July 2014 in case of lost of all original copy of exported goods and submission of without this. Nikhil: On 20 August 2014 Brilliantly written article and full of crucial details. Can please someone help me out in following details? What are the prerequisites for export under claim of rebate? Can this procedure be linked with EPCG/DEPB scheme. If yes then how? If the exporter is using ERP system then how ERP can be of use in this proces? Biswajit Bhar: On 25 May 2015 Please send Form C format for export refund claim or where from I get this form. G.Rama Mohan. : On 27 July 2015 Sir, I have a doubt. The manufacturer exporting under advance licence shall he get any rebate at the time of exporting. ie. instead of debiting under LUT, he is debiting in RE23A (Part-II) & claiming the duty debits . How he can eligible to claim that amount with the Central Excise Authorities ? Any notifications pl. specify. VIMAL DUBAL: On 02 February 2016 CAN ADDITIONAL DUTY DEBITED FOR EXPORT ALLOWED FOR REBATE OR NOT? AS ONE OF OFFICER FROM MY DIVISION IS TELLING ME THAT IT IS NOT ALLOWED. Ankita Jain : On 17 August 2016 I wanted to know the procedure to register a company in Export Promotion Council of India as I am unable to get the Clear understanding of the same from the Web. Also I wanted to know how will I get the rebates in Exports of Marbles, Hardware and other durable goods. NM: On 05 October 2016 WHY DO WE NEED TO ISSUE BOTH CT1 AND ARE1 FORMS FOR EXPORT. DOES THIS TWO FORMS HAVE DIFFERENT USE. ARE1 IS TO BE MADE BY VENDOR WHEN HE DISPATCHES THE MATERIAL. THEN WHAT IS USE OF CT1 FORM. Nihal Shrestha: On 07 December 2016 Dear Author, Whose responsibility is it to submit back the ARE-1 copy to the exporter after exported goods are cleared through custom point? Is it the liability of the importer or the exporter themselves if in any case the ARE-1 copy does not get back to the exporter? Mohit Luther : On 07 April 2017 Respected Sir We exported goods to Nepal against 2 A.R.E.1 , but during transportation of material, One A.R.E1 was lost. At the time of clearance of goods from Customs , our CHA cleared goods against single A.R.E.1. Now, When we received papers from CHA , we noticed the fact . Is it possible to get another A.R.E1 get signed from customs as our commercial Invoice contains the same number of items as present in A.R.E.1 which is to be signed. Please guide Sir. jitendra kushwah: On 13 April 2017 Dear sir, i want to ask that how can claim in import & export for 2014-15 & 15-16. and what is documents for claim. please suggest us. what is the process.